Navigate your PowerPoint presentation like a website. The Concept. (Part 1 of 2) | PowerPoint. Responsibly. (Retired site) Please see www.presentationwiz.biz for my new blog. PowerPoint. Responsibly. (Retired site) Please see www.presentationwiz.biz for my new blog. 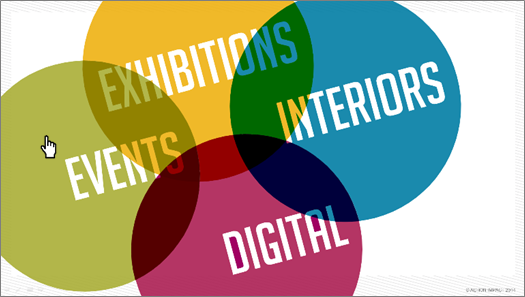 A well-designed web site allows users to easily navigate the site to find the most relevant information when—and only when—needed, creating a customized experience for each visitor. The same goes for a PowerPoint presentation that leverages Custom Shows and Action Settings, allowing the presenter to deliver content on demand, depending their varying audiences’ needs. Take Action Impact (AI), a leading brand experience and event management agency based out of the UAE, with offices in Abu Dhabi and Dubai. When developing a PowerPoint presentation to deliver their credentials, they wanted to make sure that they delivered the right information, at the right time to the right audience. So, when telling their story about their core disciplines, they wanted a presentation solution that allowed presenter to navigate through the slides, much like one might when visiting their website. Image 1. This is the launching slide for the AI core disciplines. 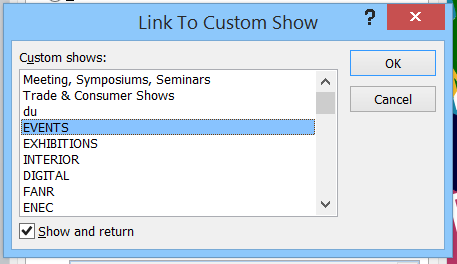 Each discipline uses an Action Setting (Image 2) that links to more slides/ detail about a particular discipline (a Custom Show named Events – Image 3). 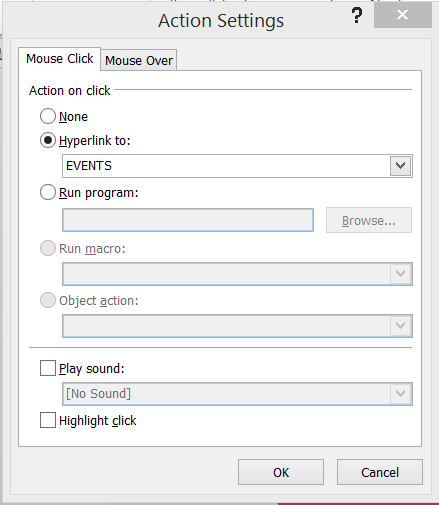 When the presenter passes a cursor over a discipline, the cursor changes to a finger pointer – in this case, Events. 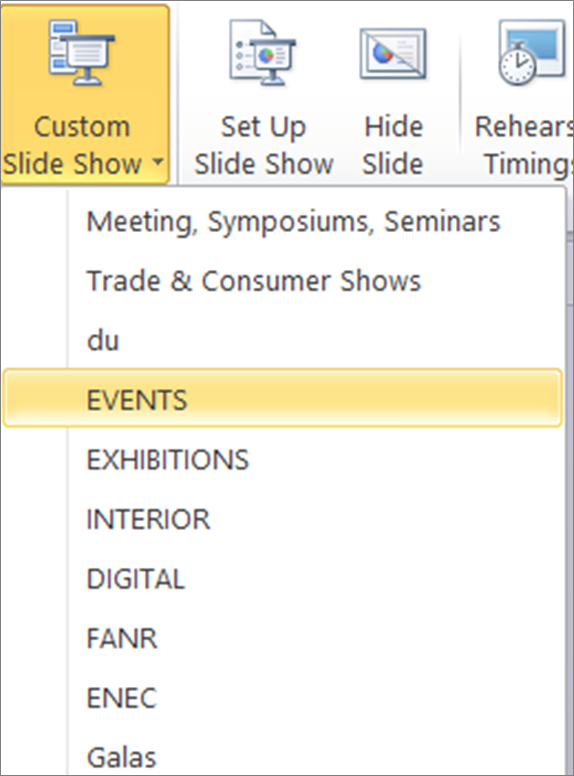 When the presenter clicks on Events, he/she jumps to the Events section of the presentation. So, from this slide, the presenter can choose to give a summary of all four disciplines and move on to the next section of the presentation or, click on one of the 4 discipline areas for more detail. The Events Custom Show is composed of 22 hidden slides (Image 4) (the crossed out numbers mean that slide is hidden) that will only show when the Action Setting is activated in the Core Disciplines launching slide. We’ve even programmed this section to only show slides 17, 18 and 19 if the audience only needs a quick over view of the Events Core. Slide 19 actually links to slides 20 – 38 – allowing for more in depth coverage of the discipline. When the presenter has completed the delivery of the Events section, he/she will automatically be returned to the Core Disciplines launching slide (Image 1). To create this behavior, we have checked the Show and Return box (Image 5).